Welcome back to the Authentic Bed & Breakfasts of Lancaster County blog. We have uploaded all of the previous blog entries for a reference to seasonal activities in Lancaster County and the surrounding areas. This entry will begin a weekly updated passport to Lancaster County, providing you with up-to-date events and activities. This week will focus on the theatre of Lancaster County, an aspect of the county that may be overlooked by a visitor only searching to learn more about its rich history. This month holds many opportunities for hilarious dinner theatre shows, or a more traditional theatre experience with “Young Frankenstein,” a faithful adaption of the classic Mel Brooks film. Two dinner theatres in Lancaster County have critically acclaimed comedies this month, both showing through March 22. Rainbow Dinner Theatre, located at 3065 Lincoln Highway East, Paradise, PA, is showing “Weekend Comedy” by Sam Bobrick, a play that has been described as “Thoroughly enjoyable...A steady rat a tat of laugh lines” by the Kansas City Star. “Weekend Comedy” centers around a middle-aged couple who go to a cabin for a lovers’ weekend only to discover that they’ve been double-booked with a young couple on their first romantic getaway. Rainbow Dinner Theatre describes the play as “Mature love vs. new love...and the laughs keep coming!” Tickets must be requested at rainbowdinnertheatre.com, where the box office will process your request for tickets as well as your wine selection. The Dutch Apple Dinner Theatre, located at 510 Centerville Road, Lancaster, PA, is showing a similarly hysterical comedy by the name of "Caught in the Net." The play, a sequel to "Run for Your Wife," follows taxi driver John Smith, a man with two families in different parts of London. Unfortunately for him, a boy from one of his families and a girl from another fall in love after meeting on the internet and request to meet each other. In their review of the play, the Daily Mail called it "Brilliant...The funniest play of the year." The price of tickets range from $17 to $42 and can be purchased at dutchapple.com. Finally, the historic Fulton Theatre will be presenting the Mel Brooks Musical "Young Frankenstein" through March 30. 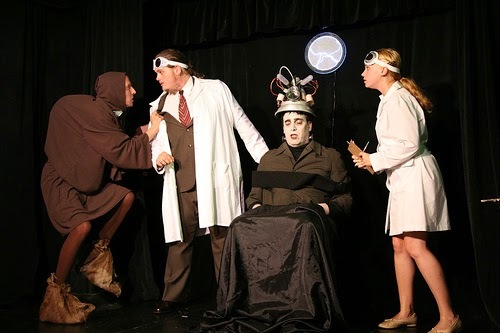 The Fulton Theatre describes the show as, "Faithfully adapted from the hilarious Mel Brooks film, 'Young Frankenstein' brings all the familiar, zany characters to life on stage, including a very large, very green monster." Tickets range in price from $25 to $65 and can be purchased at thefulton.org. As you can see, Lancaster County offers a wide variety of shows and venues, and it has a vibrant theatre scene that can please even the most experienced of viewers. Not only will a trip to Lancaster County at one of the Authentic Bed & Breakfasts provide you with unparalleled food, service, history, and atmosphere, but it will provide you with an artisitic flair that is not usually found outside of cities like New York. Take a week, a weekend, or even a day, and experience the incredibly diverse world of Lancaster County.